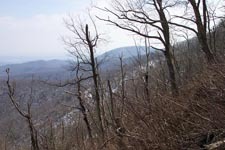 Description: This is a moderate 8.8 mile shuttle hike along the Appalachian Trail and an extension of the Pinnacle Picnic Area to Mary's Rock Out and Backdescribed elsewhere on this site. 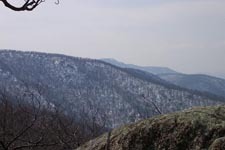 You’ll climb over the park’s third highest summit, The Pinnacle, visit Mary’s Rock, descend to Thornton Gap and climb over the summit of Pass Mountain. The first half of the hike is full of views. 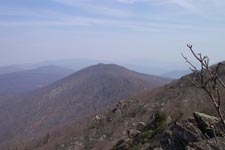 At first they are primarily to the south and west as you climb over the Pinnacle with some partial eastern views towards Old Rag and Hazel Mountain. 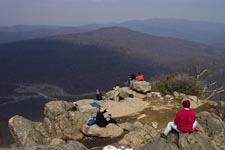 The lunch spot and focal point of the hike, Mary’s Rock, offers a 270 degree view of the surrounding area. You’ll be able to take in the town of Luray, Massanutten Mountain with New Market Gap and the tips of the Great North Mountain even further to the west, Neighbor Mountain, the Three Sisters, Knob Mountain, Pass Mountain, both Marshall Mountains and the Peak to the North and parts of the Hazel Mountain area and the Piedmont plateau to the east. As you descend to Thornton Gap you should be able to look back over your right shoulder and get a good glimpse of Old Rag. The climb up to the top of Pass Mountain looks steep on paper then it feels but is mostly a pleasant walk up a grassy trail until just before the summit. From there you’ll get a good view of Piney Ridge, the Peak and both Marshall Mountains. The descent back to the cars is a quick 1.3 miles from that point. Trail Notes (Map #1): From the main bathrooms locate the white blazes on the trees to their right. Follow the AT as it parallels the driveway. At one point the trail comes out onto the lawn at a sign with distances indicated for the Pinnacle, etc. From there the trail bears left into the woods for a bit. 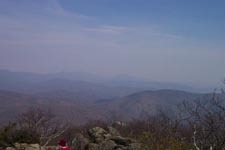 Shortly come to a sketchy spur trail to the right that leads to Jewell Gap Overlook. Turn left staying on the AT. 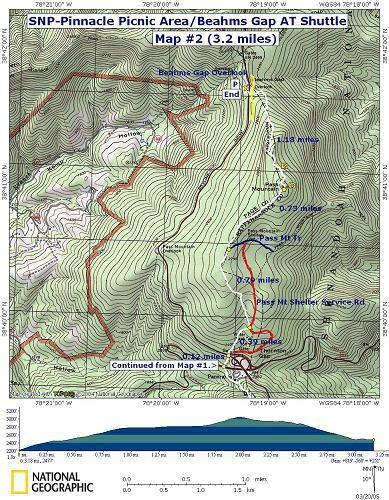 The AT will switchback and continue north under the overlook (0.43 miles from the start). Begin to climb passing the junction of blue blazed Leading Ridge Tr in another 0.22 miles. The trail will be straight and gradual for a while. As you near the top it will become steeper and weave in and out of rock formations. 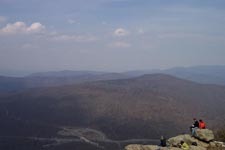 At 0.59 miles from the last trail junction arrive at a fantastic overlook with views to the south, west and north. Descend down to a sag in the ridge via a series of switchbacks. The first couple are short and steep. The last two are quite long and gradual. 0.98 miles from the overlook finds you at Byrds Nest #3, a day use only shelter. This is a good break spot. Partial views east of the Hazel Mountain area can be had along this stretch. Continue north soon coming to a concrete post marking a spring (and a service road that leads to Skyline Drive) to the right. Stay left (straight) remaining on the AT. In another 0.53 miles pass the junction of blue blazed Meadow Springs Tr to the right. Start to climb here and in another 0.62 miles arrive at the junction of the blue blazed spur trail to the left that leads to Mary’s Rock. You’ll actually walk behind Mary’s Rock just before the concrete post. Turn left and in 0.1 miles arrive at the summit of Mary’s Rock. After enjoying the view retrace your steps back to the last trail post and take the left fork onto the AT. 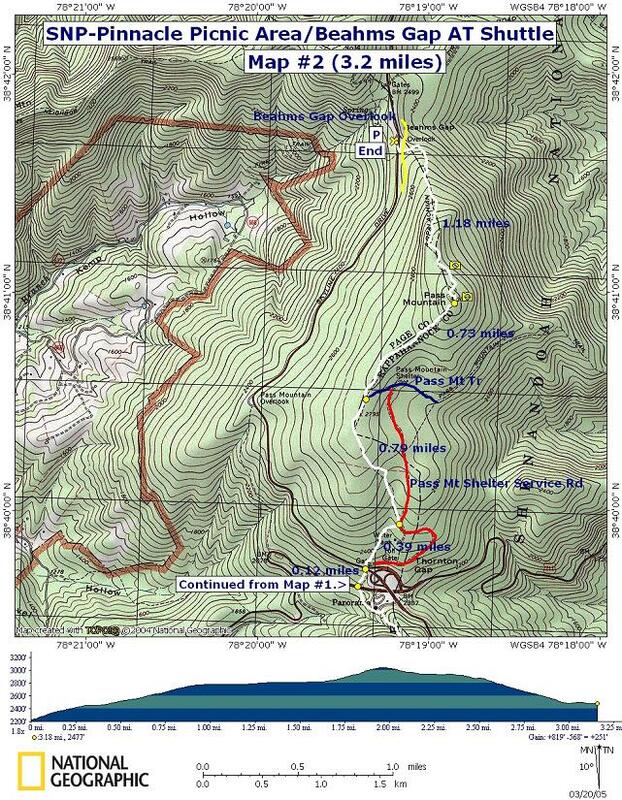 Descend to Thornton Gap, arriving at U.S. 211 at 1.83 miles from the last trail junction. Trail Notes (Map#2): Cross U.S. 211 and continue on the AT. In about 0.1 miles cross Skyline drive on a cross walk. Pass a yellow forest gate, walk a few yards up the Pass Mountain Shelter Service Rd but turn sharply left up a bank onto a footpath. Continue north. In another 0.39 miles you will temporarily join up with the service road but only for a few steps. Turn left onto a grassy footpath. 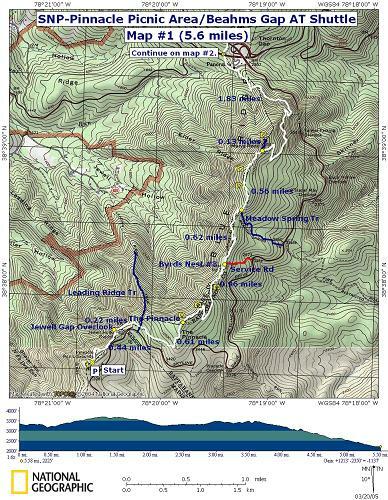 In 0.79 miles come to the junction with blue blazed Pass Mt Trail. Stay straight on the AT. You’ll walk through a nice White Pine plantation along this stretch. 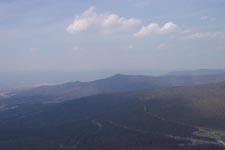 In 0.73 miles reach the summit of Pass Mountain. There is a nice flat rock to sit on as you enjoy the view of Piney Ridge, Thornton Hollow, the Peak and Marshall Mountains. From there descend quickly for 1.18 miles to Skyline Drive. 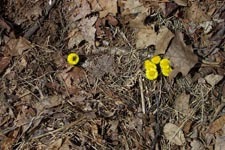 Near the end you will cross yellow blazed Branch Horse Trail. Turn right at Skyline Dr. Your waiting cars should be in sight.